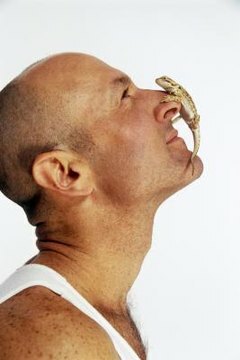 In theory, reptiles should be very odor-free pets. In contrast to mammals, reptiles produce little waste, shed infrequently and do not mark their territory with musky secretions. However, in practice many bearded dragon cages produce highly objectionable odors. It is largely the organic debris and bacteria in the cage that cause the odor; proper husbandry and cleanliness will reduce the odor and help keep your pet healthy. As long as he is clean, your bearded dragon’s body will not have much of an odor. Feces, urates—your lizard’s water-saving version of urine—and other organic material in the cage cause foul odors. Bacteria feeding on these organic materials often produce odorous gases. To be sure that your lizard stays clean, bathe him in about 1 inch of lukewarm water twice per week. Use a soft-bristled toothbrush to scrub him gently; pay special attention to the undersides of his belly, legs and tail. As a bonus, your bearded dragon may defecate in the water, which reduces the amount of cage cleaning necessary. It is wise to give your bearded drinking water before bathing him, to reduce the chances that he will drink from dirty water. Moisture allows bacteria to thrive, and should be kept low. While you must mist your bearded dragon’s cage frequently to provide him with drinking water, always be sure to allow the cage to dry between mistings. Hailing as they do from the arid deserts of Australia, hydrated bearded dragons are comfortable in low-humidity habitats. The sooner you remove feces and other odor-causing agents from the cage, the better the cage will smell. Perform a spot cleaning every afternoon by removing feces, shed skin, urates or uneaten food from the cage. You can scoop and sift sand or other particulate substrates as you would cat litter, but you must change newspaper or other sheet-like substrates daily. Every few weeks it is necessary to perform a thorough cleaning of your lizard’s habitat. For this you must use a solution that kills bacteria, yet doesn’t harm your lizard. A popular option is to mix 1 ounce of bleach, 1 tablespoon of dish soap and 1 quart of water. Alternatively, your veterinarian can recommend a commercial cleaning product. Remove and discard the substrate. Wash the cage with your cleaning solution, rinse it thoroughly and allow it to dry completely before returning your pet to his cage—be sure that you cannot smell any cleaning fumes before doing so. Replace or wash all items in the cage during deep cleanings as well, including food and water bowls. Don’t use the cleaning solution on porous objects like climbing branches; instead, scrub them with a wire brush and very hot water. While bearded dragons do create odors, their food does too. Crickets are notoriously smelly insects, and mealworms, roaches and superworms produce bad smells as well. Clean the feeder insects’ cage just as you would your bearded’s. Additionally, offer only as many insects or vegetables as your lizard can consume in about 15 to 30 minutes. Decomposing vegetables produce odors as well, so remove uneaten vegetables daily.